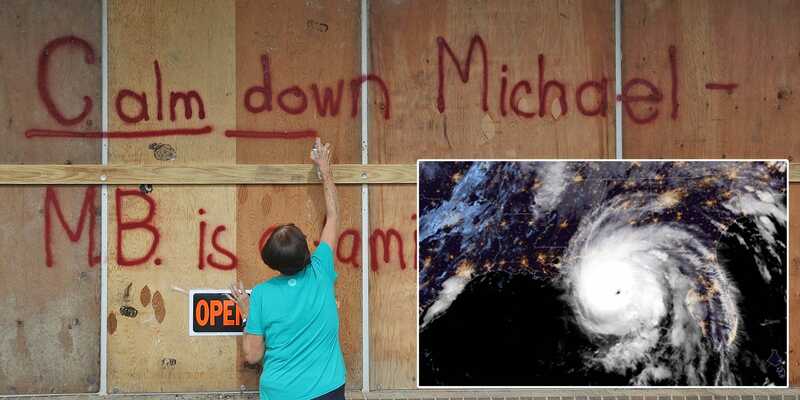 Joe Raedle/Getty Images/Twitter/NOAA/Business InsiderA composite image showing a woman spray painting on the plywood over her daughter’s business on Tuesday in Mexico Beach, Florida, and a satellite view of the hurricane off the Florida coast. 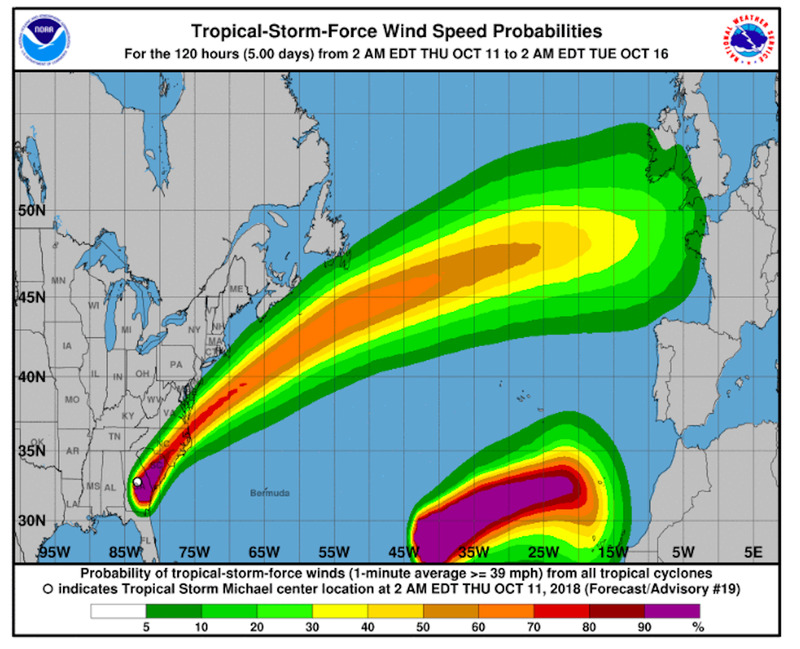 Hurricane Michael wreaked havoc in Florida as a category-4 storm, and is now moving across Georgia as a tropical storm with sustained winds of 50mph. The storm is expected to move into South Carolina on Thursday morning, and later will affect North Carolina and Virginia. States of emergency are in place in Georgia, North Carolina and South Carolina. 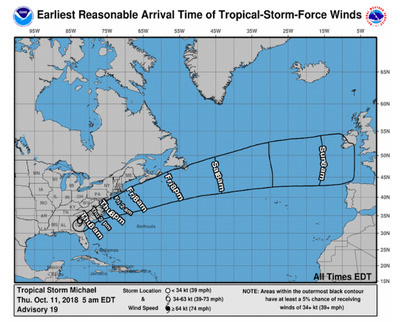 South Carolina, North Carolina, and Virginia are in the path of Tropical Storm Michael, which is currently bringing heavy rain and 50 mph winds to Georgia. The storm made landfall in Florida on Wednesday as Hurricane Michael, where it killed two people and caused widespread devastation as the worst storm ever recorded in the region. The storm is now likely to move to South Carolina on Thursday evening, before moving to Virginia and the Carolinas late Thursday night or early Friday morning. Some of those areas are still working to recover from Hurricane Florence. As of 5 a.m. ET on Thursday, the storm was 30 miles west of Augusta, Georgia. Gov. Nathan Deal of Georgia issued an emergency declaration for 92 counties in the southern part of that state. “The emergency declaration is effective for seven days and makes all state resources available to local governments and entities within the impacted area of the hurricane,” his office said. South Carolina’s state of emergency after Hurricane Florence was extended by Gov. Henry McMaster. “We know that Hurricane Michael is going to mean high winds in parts of the state and will bring the possibility of dangerous flash flooding along with it,” he said on Wednesday. Over 90,000 homes in South Carolina were without power on Thursday morning, the state’s emergency management division said. National Weather Service maps show when wind and rain is likely to arrive in various states. 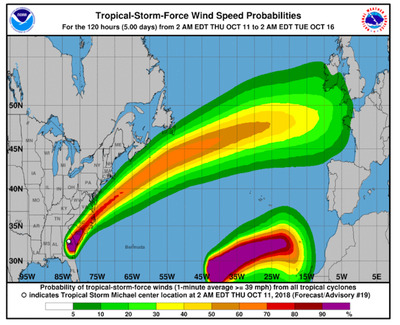 National Hurricane Center.Hurricane Michael wind probabilities as of 2am EDT on Thursday. National Hurricane CenterThe earliest reasonable arrival time of tropical-storm-force winds in different states as of 5 a.m. EDT on Thursday. As of Thursday morning, a storm surge watch is in effect in North Carolina, for the coastal areas between the Ocracoke Inlet and Duck. A tropical storm warning is in effect from Fernandina Beach, Florida to Duck, North Carolina, as well as in Pamlico and Albemarle Sounds, North Carolina. 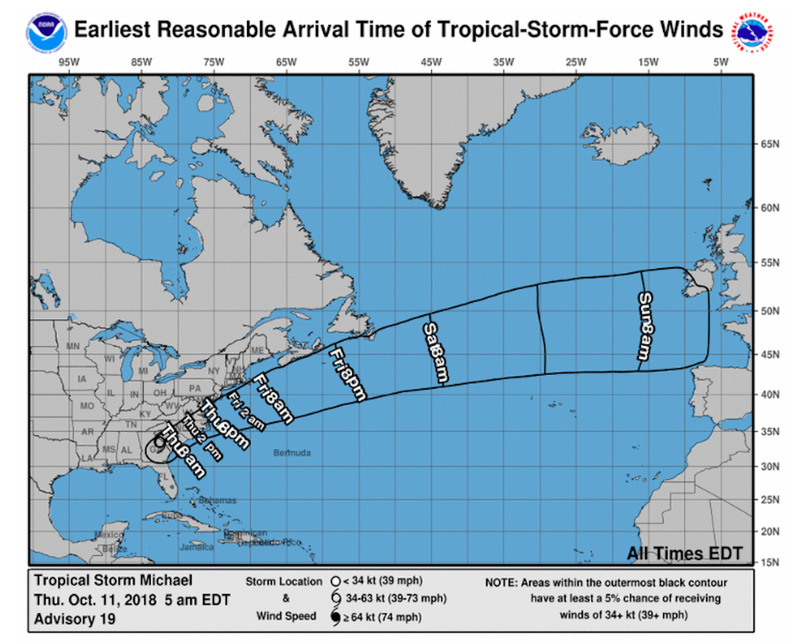 Michael’s effects have also reached Alabama, where 45,000 customers have had their power disrupted, according to Alabama Power. Ahead of the storm, Jeff Byard, the associate administrator for the Federal Emergency Management Agency (FEMA), told reporters on a conference that the Southeast should brace for “major infrastructure damage,” Reuters reported. Specifically, electricity distribution, wastewater treatment systems, and transportation networks are likely to be impacted.